Visiting Plains is like stepping back in time to a much slower paced lifestyle. You may want to start your trip at the Plains Railroad Depot located at the corner of Main Street and M.L. Hudson Street. The 1888 depot was the first building constructed in this area. It was used for freight and passengers serving the agricultural community of Plains through the 1960s. The depot received worldwide fame in 1976 when it became the Plains headquarters for the 1976 Carter Presidential Campaign. This was the site for numerous news conferences,celebrations, and gatherings of Carter supporters. 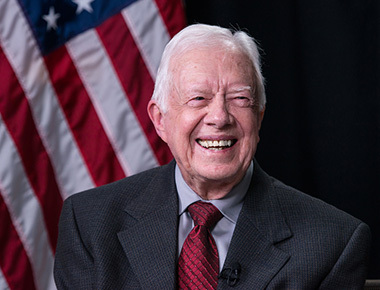 The Depot now is a museum devoted to the history of the Carter presidential campaign. Former First Lady Rosalynn Carter answers student questions in the 1930s classroom. Rosalynn Carter talking to students about her school days at Plains High School in the 1930s Restored Classroom. Mrs. Carter started school at Plains High School as a first grader and then graduated from this school in the 11th grade. Schools in Georgia did not offer 12th grade until the 1950s.